This post got featured in the Spicy Saturday Picks on Blogadda. 2318 kilometres, 34 hours, 7 states and a LOT of time for food and sleep, welcome aboard the Bengaluru Rajdhani Express. 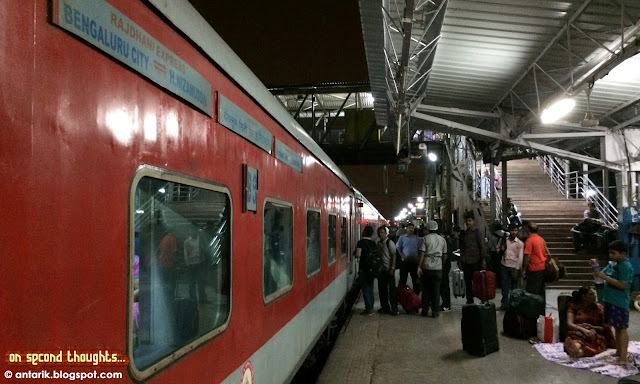 I arrived at the Hazrat Nizamuddin Railway Station on Wednesday evening just as the Bengaluru Rajdhani pulled in to Platform #4. With enough time in hand, I decided to take a trip to the end of the train and then come back and take my seat. The 5 digit coach numbers started with ‘11’ and I checked the date at the end of the coach to make sure- yes, this was a 2011 build, brought into service early in 2012. As I entered my coach, I was actually impressed with the neatness of it. I put the luggage and settled comfortably on my seat, waiting for the 34 hour journey to kick off. “34 hours? That’s like I would sleep tonight, wake tomorrow, sleep tomorrow and wake the next day and you shall still be in the train!” My friend had replied in shock earlier in the day. Exactly at 8.45 PM, as the train began its long journey, the catering and housekeeping guys sprung to action immediately. I am no fan of air travel and would prefer rail over air any day. Yes, I am crazy about trains as much as I am about travelling to new destinations. 7 years ago on a hot June morning, I left for Delhi with my grandmother on the Bhubaneswar Rajdhani Express. 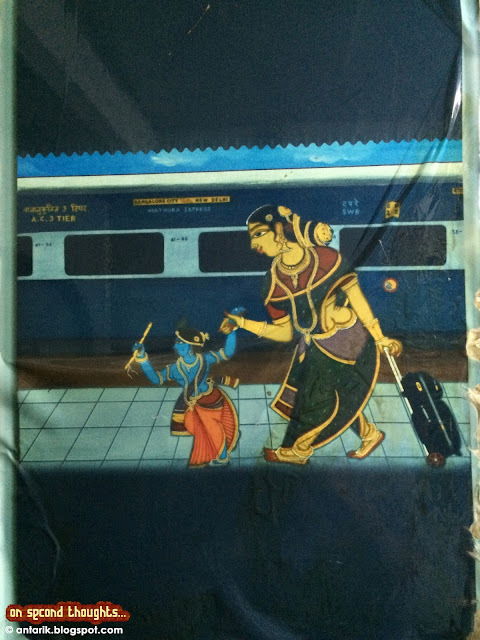 It was my first Rajdhani journey and I absolutely fell in love with the hospitality received aboard the train. 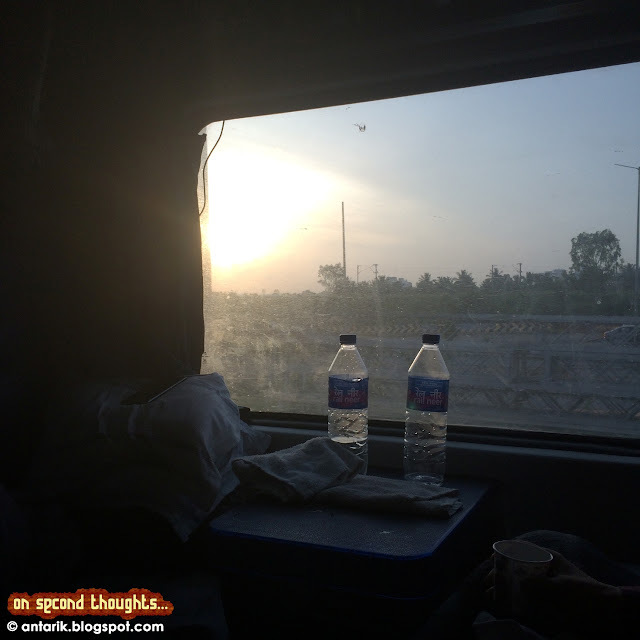 Since that day whenever I had to go to a new destination, the Rajdhani was my first and most preferred choice. The Jammu Rajdhani had been the next one, in October 2011. Two visits to Mumbai took me on the August Kranti Rajdhani and the Premium Express train last year. Last week, I was aboard the Bilapsur Rajdhani from Nagpur on the way to Delhi. And now, I sit in the Bengaluru Rajdhani, the ticket for which was booked two weeks ago solely on my insistence that I wanted to travel on a longer-distance Rajdhani and be pampered with the apparently ‘free food’. “Bengaluru Rajdhani’s food is bad, be aware!” a rail-enthusiast friend had warned. I would soon know for myself, I thought. I looked around at my fellow coach mates. 4 guys and a girl- all in their early 20s and a man in his 40s. One seat remained vacant throughout the journey. I could spot a couple of African men in the next compartment, but most of the coach was filled with youngsters from North India (They were speaking in Hindi), as against the South Indian families I had expected. With the dinner done, we were soon retiring for the night. I always prefer the Side Upper berth in these kind of long journeys as it gives the flexibility of sitting or sleeping as per one’s convenience. The disadvantage with this is the absence of a charging point on this side of the compartment. Also, since the reading lights no longer exist on the berths, once the compartment lights are off, all you can do is use your phone or laptop for passing the time until you fall asleep. I managed to watch two full Game of Thrones episodes before my laptop’s battery gave way. It was already past one in the night and I decided to call it a day. ‘Sir, tea?” Ajay, the catering guy, woke me up. I opened my eyes to see bright light coming in through the windows. I checked the time, it was 5.45 AM. He handed me a Bru sachet as I got up and held the tray. I do not like tea or coffee. I don’t understand why people have either of the two drinks- I find them absolutely tasteless. Yes, I still prefer Horlicks! The Rajdhani journeys are the only ones where I do not miss the tea/coffee. For one, you are pampered with bed tea early in the morning and two, the milk powder and sugar in hot water with a pinch of tea/coffee powder hardly gives the taste of anything but flavoured sweetened milk. I knew for once that the breakfast trays had been set before he went to sleep last night. The food was simply being heated and served now. (That is the case with all the food in all the Rajdhanis- they are prepared elsewhere and at least 5-6 hours in advance are loaded in the train. They are kept in hot buffet trays in each coach to be taken out and served at the right times). 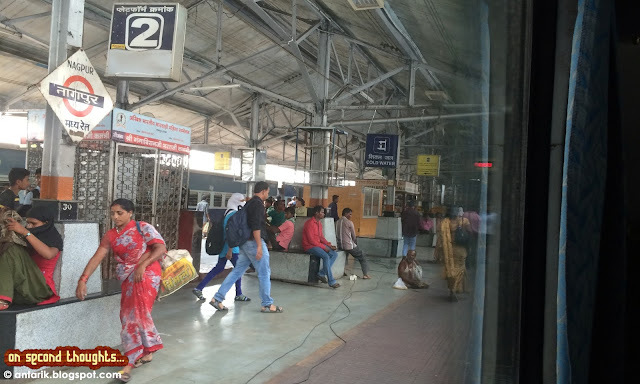 As I woke up, I heard the sound of some devotional songs including ‘Sai Ram, Sai Shyam…’ coming in from the next compartment which was occupied by a couple of old ladies. The breakfast menu surprised me. Instead of the usual vegetable cutlets, there was upma and vada-sambar. The South-Indianness is now visible, I thought. They tasted fine but I would have preferred the cutlets. We were still in Madhya Pradesh, the Southern states another few hours away. 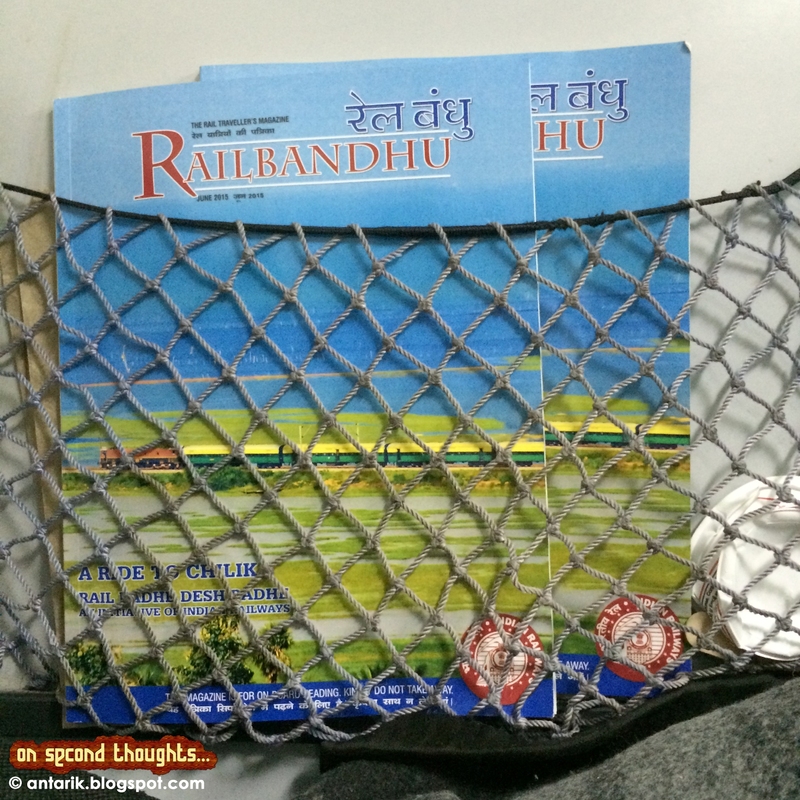 A new thing I noticed on the Rajdhani was the on-board rail magazine: Railbandhu. Although it was the second day of July already, many copies of the June issue of the magazine lay in the compartment. More than 50 % of the pages were advertisements and the travel stories and other articles in the issue were informative and well written. A 34 hour train journey can be absolutely boring. But ‘boring’ here is a very relative term. Earlier travellers had walkmans and mp3 players glued into their ears, now it is mostly laptops. Now, as many as six laptops were actively in use at some point of time during the journey in my compartment alone. Surprisingly, the guy on the next seat was engrossed in the new Amish Tripathi book ‘Scion of Ikshvakhu’ and was keen on finishing it before the end of the journey. As for me, all I needed was a window seat so I could stare out of the window all day long and not get bored. As we crossed Maharashtra late in the afternoon, the evening tea with the sandwich, samosa and soan cake was the closest the meals came to being non-South Indian. I wish they would start serving dosa some day soon. The best part of travelling in Rajdhani is the fact that being the country’s premier train, it is given priority at almost all times over other trains and so there is rarely a delay. Also, unlike my previous Rajdhani journeys, the on-board public address system wasn’t working on this train (or atleast in my coach). I got down at a few major junctions including Nagpur and Secunderabad to stretch my legs and walk around the stations a bit. The appetiser for dinner on the second day was rasam instead of the usual soup and soupsticks and I turned it down. The dal in the dinner was now replaced with sambar and the paneer curry with kofta. We were travelling through Andhra Pradesh, soon to enter Karnataka. After dinner, as is the custom (and discouraged by the Railways), Ajay and his mate came around asking for tips for their service. I have given in to their wishes since I got to know a few Rajdhani journeys ago about their measly salaries and long working days. 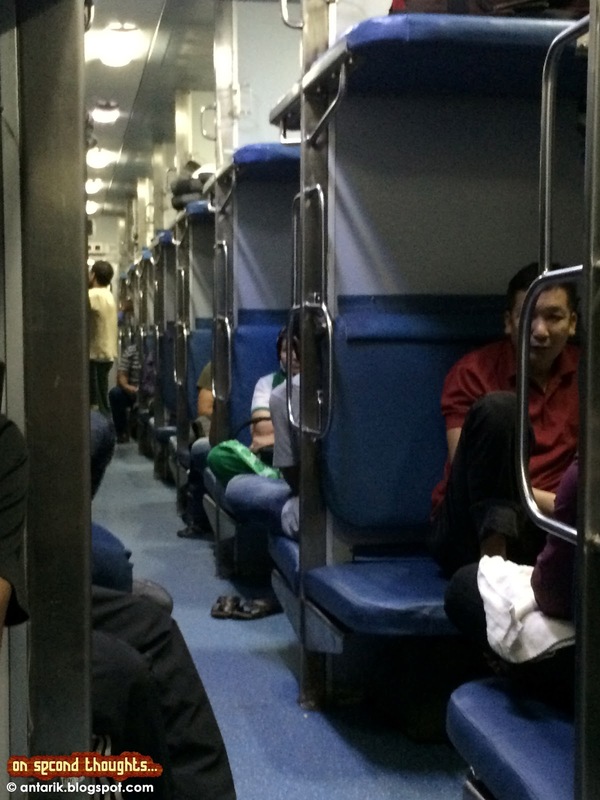 “So is this the end of your service?” a co-passenger asked. “Where are you from?” I asked him. “That hardly leaves any holidays,” I said looking at the two men probably in their 30s, one balding, the other proudly moustached. The two just smiled as they moved to the next compartment. I wanted to ask how much they earned, but preferred a Google search and asking my rail enthusiast friend about it over directly asking them. 10 grands is not a big amount. I spent some minutes reading the first few pages of The Mahabharata Quest before opening my laptop and watching another episode of Game of Thrones. I retired for the night early and soon enough was woken up by the sound of switches clicking the lights on throughout the coach. It was day break and the train was less than an hour away from reaching its destination. As the travellers slowly put their blankets away and freshened up, Ajay came around with a tray of tea cups. I picked a hot cup and warmed myself as the rising sun cast a bright morning light into the compartment and the Rajdhani Express rolled into Bengaluru City station, culminating its 34 hour sojourn. Traveling by 2nd AC I prefer if I have budget in hand. The journey is awesome most of the time if I am in 2nd AC and if the train is Rajdhani or August Kranti Rajdhani express I agree time pass very well with catering guys always at service by serving sometime tea, soup, dinner, breakfast and lunch. I prefer side lower berth but they are little less wide. Or I prefer lower berth. Wonderfully narrated embellished with relevant photographs! That's true Kalpanaa. Once in a while, a long journey with all the hospitality- great way to just relax. It's such an interesting post. I really like it. You shared a really good information I appreciate it. Thank you and keep sharing.